Doors opened on moving Vic Line train - human error? An inquiry has been launched after the doors of a London Underground train were opened by the driver in error as it approached a red signal. 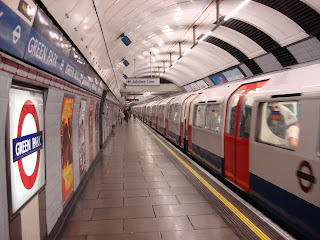 The southbound Victoria Line train was coming to rest in a tunnel outside Brixton station, south London, when the doors opened. Transport for London (TfL) said the doors were immediately closed again. It added that the driver confirmed the incident on Wednesday evening was the result of human error. A TfL spokesman said: "London Underground has launched a full investigation after a southbound 67-stock Victoria line train approaching Brixton on Wednesday evening unexpectedly opened its doors as it came to rest at a red signal. "The train was checked following the incident and no customers were affected." This seems a pretty good example of where the failure is actually in allowing the human to make the error in the first place. Whether in the design of the door operation or in how they are maintained, designing out the potential to make this kind of error is the important factor. Followers of this blog will know that we're always interested in human issues in design related to transport systems. Clearly one of the issues with high speed rail is how you avoid stopping which wastes time and energy - but stopping is useful to the passengers to actually get on and off. So we were amused and interested to see this solution from an engineer in China. The idea being the train doesn't stop - you get on a sort of transit vehicle which hooks up to the train as it passes the station, you then move down into the train itself. The transit vehicle stays attached and the people getting off at the next station move into as they approach the station; it disconnects and slowly comes to a halt at the station. Whether the hassle of having to get down to one end of the train to get off will be worth the potential improvements in journey time is perhaps debatable. An interesting solution though! Can we get back to something more tactile? Access to digital media has transformed many areas of our lives. Yet in some ways it has removed something - see how iTunes looks to keep the artwork of album covers - and one of those is something interactive and tactile. It contains some interesting things that aren't too far off like accessing information in a similar way to the internet, scanning documents to create digital versions. But we loved that they didn't think phones would have changed much. Anyway, hope you find it interesting too. ...with this video we came across of a long forgotten idea from Sun in 1994 for future systems called Starfire. It's a big desk but there's lots there that isn't a million miles away - touch interaction, video-conferencing, instant messaging, collaborative working environments on documents, scanning & embedded information into other media, 3D modelling and texture mapping, etc. Maybe we still have some way to go on voice control & telepresence. What does "ergonomics" mean for designing work spaces & buildings? At CCD, most of our work is the application of ergonomics/human factors to the design of the built environment; in particular to control centres. But the use of the term "ergonomics" often brings confusion and misunderstanding about what we actually do and the value that it brings to projects. This seems to be largely due to the strengthening association of the term ergonomics with office seating, mice, keyboards, etc, and by its use in marketing some consumer products. So for the built environment more and more people think that ergonomics/human factors is just about the physical work space - is the desk at the right height? Can the user reach something? These are important but only describe a small portion of the approach that ergonomics should bring to human centered design. So what does it really do? Well for us, it is a broader design of the working "system" around the human. This can be physical but it's not just about minimising RSI - its about communication, facilitating team working, spatial relationships. It's about creating a working environment that is suitable for the work that is being done. It's also about the socio-technical issues and the interaction between people, teams and technology. What are the jobs we are asking people to do? How do we manage the change that the design of the environment or the technology will bring about? And it's also about the psychological. How will people behave in diffierent environments which we design? How can we influence motivation, vigilance or even feelings of wellbeing? Until we can reclaim the word ergonomics from its increasingly narrowly perceived definition, perhaps we have to stop using it to get the message across? But then how do designers who use the broader application of ergonomics differentiate themselves? Luton Airport are introducing holographic helpers to advise passengers and help them to get through the security checks more easily and efficiently. An interesting concept. As we all know airport security is confusing and stressful. There are an array of signs trying to tell us what to do but trying to absorb this information in this situation is difficult - so we usually fail to do so, further increasing the stress of the uncertainty. Perhaps the ideal would be just to have more staff on duty but the repition of information is something people aren't great at doing - certainly not with any enthusiasm - and we have to recognise that the cost would be high. People are best for responding to questions and dealing with odd events. So it would seem that something like these holograms, that can deliver the basic information in a more absorbable way, may have something going for them. Anyone going through Luton Airport that sees them in operation, please do comment with your views.